Don’t let me the name Blues Driver colour your opinion of this pedal until you’ve tried it. 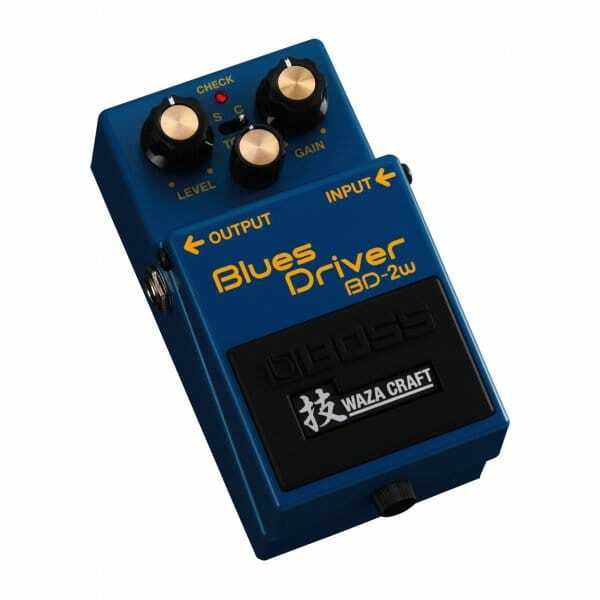 Yes, it’s a great sounding pedal for blues music, with the gain rolled back the Boss Waza Craft BD-2w Blues Driver has a wonderfully amp like warmth to it and the right amount of sparkle to the gain without entering the sparkly world of fizziness. The original Blues driver, released in 1995, is something of a recent classic with a lot of players falling for it’s evident warmth but the Blues Driver title sometimes hides the fact that there is a lot of gain in the engine of the BD-2. Steve Vai has been using a BD-2 in his travelling rig for years now and it’s easy to hear why as it can sound very Vai like at times. In recent times the mod market has taken to creating different variants of modifications to eh BD-2, either expanding on gain or increasing the eq spectrum and there have been some great mods available on the older BD-2. Boss released that they are missing out on the ‘custom’ market so have decided to create their own, imagine Boss having a ‘Custom Shop’ and that’s to what the new ‘Waza Craft’ pedals are all about. They have looked at the Boss back catalogue, including discontinued models and chose some that they feel could have a refresh, reboot and internal make over. The Boss Waza Craft BD-2 Blues Driver has the architecture of the original BD-2 but the boffins at Boss have added to the circuit and via a micro switch on the top panel of the pedal the option if there to switch between ‘Classic’ and ‘Modded’, in this case I think it would be fair to say it’s been hot-rodded. The amount of gain out of the Waza Craft BD-2w has been upped, this now feels like a very good JTM45 on steroids. The pedal has a small amount of compression on the input so it has a satisfying sag under a guitarists fingertips. It’s remarkable how fluid it makes legato lines and, in equal measure, how it responds to digging in, you can really bite with the Waza Craft BD-2w. This could very well be the answer for guitarists who have been searching for a warm sounding overdrive pedal that bridges the gap between ‘Overdrive’ and ‘Distortion’. Get one of these while you can as this promises to become a very popular pedal.